I do not have the answer, but let me jump in to clarify (I hope) what the OP is asking. He is not asking about the grooves that the strings are riding in (hence a fret saw will not work). He wants to make very small “tee slots” for the individual white pieces of the bridge to slide in. 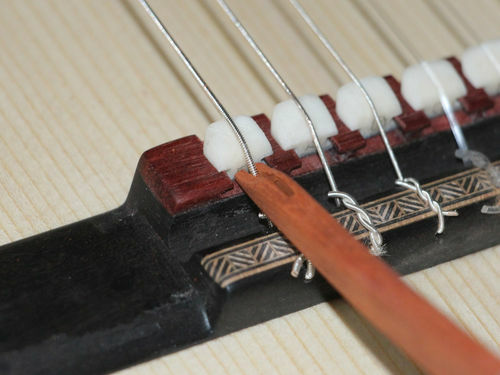 This will allow for adjustment to achieve proper intonation of the instrument. I will have to think about it, but for now I have no good idea about how to achieve this, short of some custom made bits or much more time with some very small files than anyone would choose to endure. What I would be concerned about is that this looks incredibly fragile to me. The tops of the “tees” are anchored by very narrow sections of wood and the direction of the grain suggests to me that they are just crying to pop off. Making the machined block that the individual bridges ride in out of something other than wood seems like a good idea. Not as great a look, but better in the long run. The individual bridge pieces are not wood, so why shouldn’t the piece they rest in be something else too? Maybe a Dremel tool? Perhaps you could cut the vertical slot by hand that’s wide enough for the neck of the slot cutter and then finish with the Dremel. In the pics above, it looks to me like they might have been precision cut by hand. Extra fine chisels and a diamond wire saw blade? I dunno. Looks like some fine work there. Grove out a piece with a straight router bit, then take the grooved piece to a scroll saw to cut the T out or use a hand coping saw. Do you have a drill press? If so, maybe if you chuck the Dremel bit and move the piece under the bit you could get a more stable set up and therefore more accuracy. Just thinkin’ out loud here. I was thinking exactly like patcollins. use a coping saw or a scroll saw after cutting the big slot. Get youself a keyhole router bit. They’re typically used to make that hole in the back of a piece of wood that fits over a nail to hang on the wall. Cut the slots with whatever then use a ground down Dremel router bit. 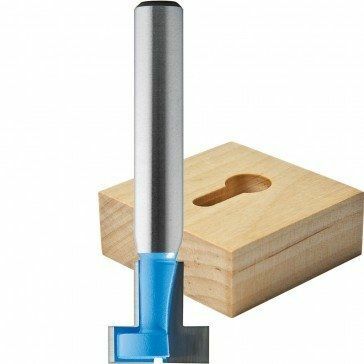 Here is Rockler’s version of a keyhole router bit. Different makers will have slightly different dimensions. A keyhole bit was my first thought too, but the T portion of the slot looks to only be about 1/4th as large as the keyhole bit would produce. It looks to me like he needs something smaller than the thickness of a dime. Here is Rockler s version of a keyhole router bit. Different makers will have slightly different dimensions. I’ve never tried this, but what if you cut vertical slot with a router and then cut the “T” with a coping saw. Whiteside will make about any profile you want. I would think they can modify their keyhole bit to the desired dimensions. Somebody made a tool to cut the profiles pictured in OP post. Are the pictures shown, examples of pieces of wood that were mass produced? A fret saw would probably be a cheaper alternative. Remember that luthiers use a lot of hand tools. I really think that most of you are over thinking this. 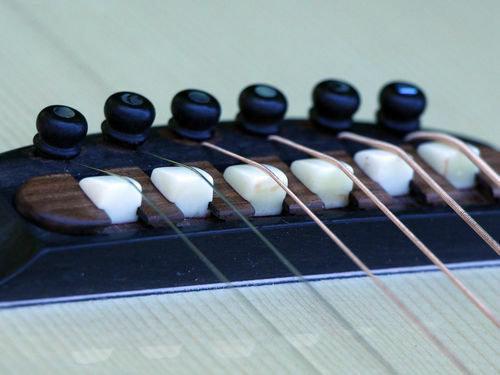 The entire slot can be cut with a fret saw. Trying to do that with a miniature router bit will most likely get you a lot of chip out and each slot would only take a couple of minutes with a fret saw. If you were going to mass produce them it might make sense to have a custom bit made, but if you are just making them one at a time, a fret or even coping saw will handle this fairly easily and quickly, though to handle the tight corners a fret saw would be ideal. You can always clean up the corners if necessary with a thin knife as you would with a chisel on a larger slot. Those are small slots, I would glue up the bridge from thin sheets of veneer. But I think dovetails would be easier. Woodworkers Supply has a large selection of brad point bits including HSS and carbide tipped bits; also forstener bits. These appear to be industrial quality bits instead of the consumer grade “Irwin” bits. As others suggested, I’d cut the slots with a router (using a backer to avoid chip-out) then finish the profile with a coping saw. Maybe there is a LJ that has a 3D printer that can help you out. They are all the same so one 3D print would do the job. I would probably tackle this problem using a 5 step method and some thicker oversized material. The first step would be to cut dados in one piece that are deep enough and width enough to hold the white bridge pins. The second step would be to face glue the dadoed piece to a piece of flat stock, being careful to keep glue out of the voids created by the dados. 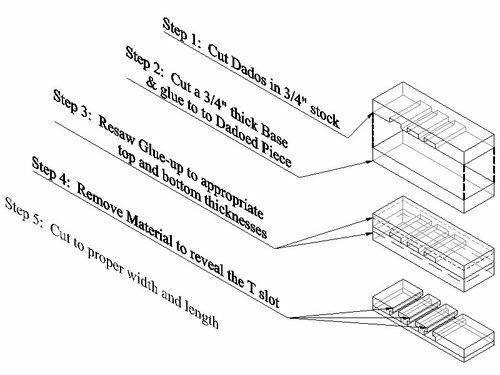 The third step would be to resaw the glue-up to arrive at the proper overall thickness, ensuring the resaw cuts leave the proper amount of material over the dado to retain the bridge pins. The fourth step, after smoothing out the resaw marks, would be to cut a slot above each dado to reveal the T slot. The last step would be to trim the piece to proper width and length. If you go to the original website you can see at least one picture of a saddle made from glued up pieces. I still think a dovetail would be easier.